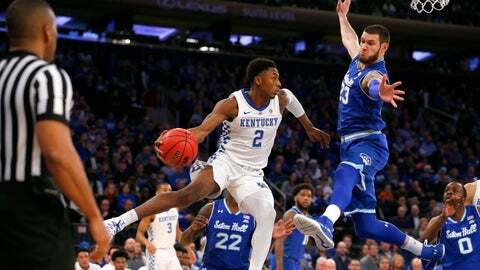 Myles Cale hit a go-ahead 3-pointer with 9.5 seconds remaining and the Pirates overcame Johnson’s half-court fling that tied the score, stunning Kentucky 84-83 on Saturday in a Madison Square Garden thriller. The clock showed 1.1 seconds after Powell’s step-back, double-clutch jumper from the left side went through, but officials made it 1.5 seconds after a replay review. That made all the difference for Kentucky when PJ Washington inbounded from the baseline and threw a long pass to an open Johnson, even though the play wasn’t designed for him to receive the ball. Kentucky rooters roared and Seton Hall coach Kevin Willard, stomping and pointing on the sideline only moments before, simply dropped his head in disbelief. A blue-clad crowd of 10,244, split between the schools probably in Kentucky’s favor, was still buzzing as the teams got ready for overtime to settle the Citi Hoops Classic. “There’s just something special about this place,” Willard said. Reid Travis added 13 points before fouling out with 2:20 remaining in regulation. Johnson, the team’s leading scorer at 15.9 points per game, was held to 10 after going scoreless in the first half. “We practice that all the time,” Cale said. McKnight had 15 points and five assists. Thompson, who missed Tuesday’s win over New Hampshire with an ankle injury, contributed 13 points off the bench. Seton Hall quickly recovered from Johnson’s incredible shot, scoring the first four points in overtime. A 3-pointer by Johnson with 43.9 seconds left gave the Wildcats an 82-81 lead, and Ashton Hagans made one of two free throws for Kentucky with 24.9 seconds to go. Seton Hall: The underdog Pirates pulled off the upset for a big resume-builder in their toughest test yet as they tune up for Big East play, which begins Dec. 29 against St. John’s. After making three consecutive trips to the NCAA Tournament, including a win over N.C. State last season, Seton Hall is trying to duplicate that success with a new group led by Powell. Last season’s senior class combined for more than 5,000 points, and only five Pirates on the current roster played for the team last season. Willard blamed himself for eschewing his preferred philosophy and guarding the inbounder at the end of regulation. Still, his resilient Pirates wouldn’t fold. “They bailed me out,” he said. Seton Hall: Michael Nzei, Sandro Mamukelashvili and Jared Rhoden fouled out. … Powell got hot late and finished 6 for 11 on 3s. … Playing about 17 miles from their New Jersey campus, the Pirates improved to 9-3 at Madison Square Garden over the last three seasons.